This cool mag for kids is the BEST value for money on the market. There are NO ADS, just heaps of quality information. Each issue contains short articles on history, nature and archaeology, written in a fun and entertaining way. The kids enjoy reading them so much they don't even know they are LEARNING something. And you will be surprised at how much they learn from this general knowledge magazine. 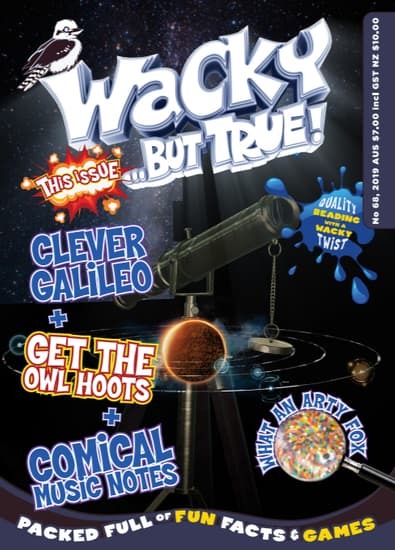 Aimed at 8-14 year olds this mag is a winner with boys and girls alike, and even adults say they love reading it. Plus there are loads of fun activity pages and wacky bits and pieces from this wacky world of ours - wacky events, wacky people and wacky places - all for the cost of only one hamburger a month!. Whack in a subscription today and see for yourselves! While this magazine is on the pricey side, I&apos;d have to say its extremely worth every penny. No assumptions or theories in here just plain good ol wacky but true stuff that kids absolutely love. Educational AND entertaining. All four of my kids read it cover to cover.